Beat the yolks with the sugar and nutmeg in a large mixing bowl until the mixture lightens in color and falls off the whisk in a solid "ribbon." 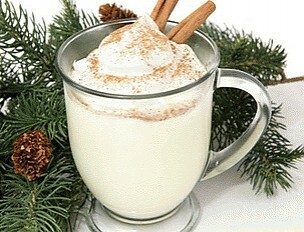 Serve in mugs or cups topped with a dallop of NVD Grand Cali Whipped Cream and little extra nutmeg grated right on top. Add the heavy cream and sugar to the bowl of an electric mixer fitted with a whisk attachment and whip until it forms soft peaks. Add the brandy and mix in.